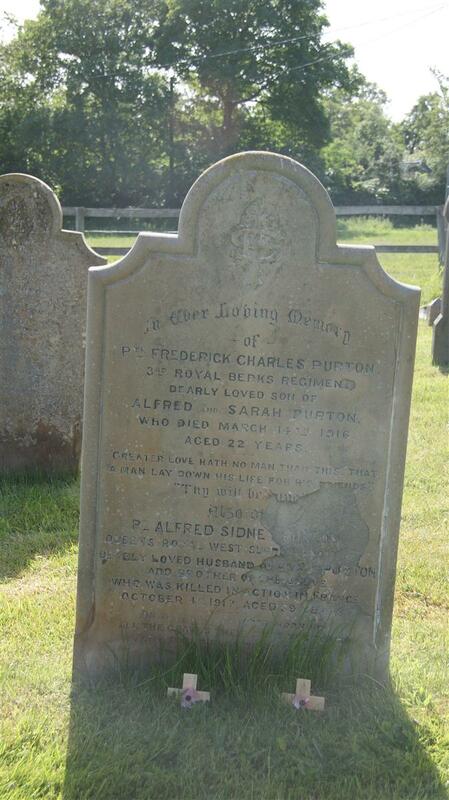 ﻿In Ever Loving Memory / of / Pte Frederick Charles Purton / 3rd Royal Berks Regiment / dearly loved son of / Alfred and Sarah Purton / who died March 14th 1916 / aged 22 years. / “Greater love hath no man than this that / a man lay down his life for his friends.” / “Thy will be done” / Also of / Pte Alfred Sidney Purton / Queens Royal West Surrey Regt / dearly loved husband of Annie Purton / and brother of the above / who was killed in action in France / October 4th 1917 Aged 39 years / On that happy morning / all the graves their dead restore. / Father, children, wife and mother / meet once more.